Integrate… Your project will be developed with an integrated results driven Internet marketing strategy to improve online performance in 4 primary GROWTH systems—attraction, conversion, retention, and leverage. Automate…Marketing technology and automation will be employed to deliver your message, and get in front of more customers with LESS COST. You can take advantage of technology to reduce selling costs, reduce order and fulfillment costs, and improve sales team performance. With our systems and process you will make use of technology to track and collect customer, sales, and marketing information. Some of the many different types of marketing technologies we utilize include: eCommerce and eBusiness websites, CRM and sales force automation, campaign delivery automation, web analytics programs, email tracking and more. Measure… Marketing metrics are used to help you determine what’s working and what’s not. We help you determine where, when, and how to invest in Internet marketing strategies, and who to target with what offer to produce the BEST response and ROI. Every project, campaign, or marketing activity is measured, and we help you determine your potential ROI - BEFORE you do anything. In business since June 30, 2000. Key managers have advanced college degrees and over 15 years of experience in their fields. To many of our clients we are Super Heroes. We increased profits and sales for our clients and some at tremendous rate of return. Most of our clients see a return on investment of 3:1. For every dollar they give us they get $3.00 back. See how one manufacturer went from $9,000 in gross profits a month to $900,000 in gross profits a month. A retail company saw a 25 year old company reach record sales. Track Record: See a few of our case studies and find out the successes our clients have experienced. Marketing Case Studies. Regardless of who you select for your marketing company, besides education, experience, and approach be sure the company as a written process to achieve success. You should receive a detailed statement of work that clearly outlines, step by step the deliverables and expected outcome. 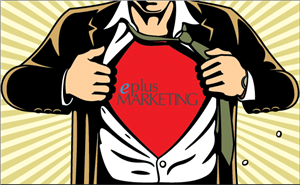 Take a look at the process you'll receive from ePlus Marketing. 7-Step Process. See and hear what our clients have to say about us. Client's Testimonials. To start driven your revenue rapidly, you should either call us directly at 314-569-9880, to see if we fit your needs or order a free marketing assessment.